← No Shoes, No Shirt, No Soul – No Service! Over the weekend I settled down to watch Back in Black, the docu-drama about Sir Terry Pratchett on the BBC. Curiously containing a strange amalgamation of actor Paul Kaye with the appearance and sound of Britain’s finest fantasy writer (YMMV), it was a touching, gentle history of the Discworld’s ultimate Creator. 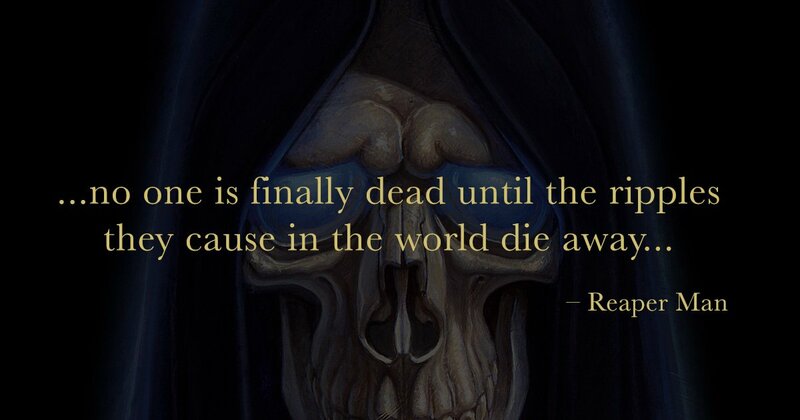 It was also saddening, of course, as grief always is. The reactions of Rhiannon, Sir Terry’s daughter, and many of his fans, were honest and human and generated immediate empathy, that shared experience of loss and absence. 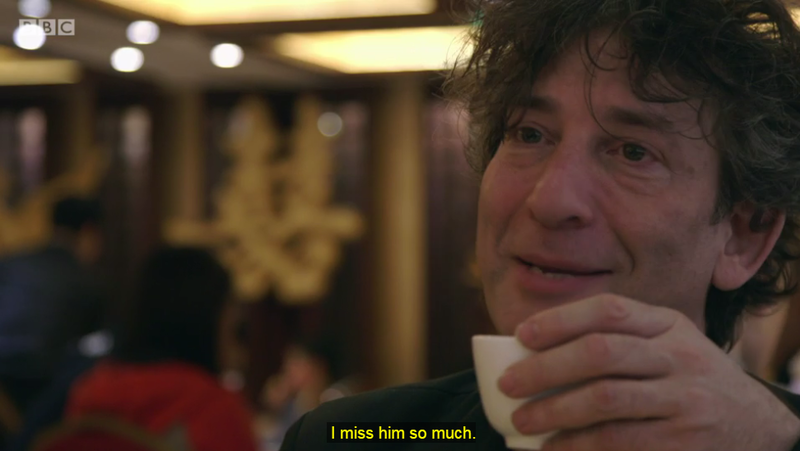 For me, the most painful moment was the interview with equally renowned author Neil Gaiman. Terry’s collaborative partner on the darkly witty Good Omens – soon to receive a TV adaption – Neil has been closely involved with much of the remembrance and memorialisation. I had to leave the London Memorial early sadly, so I particularly appreciated seeing some of Neil’s recitation to the audience. In a quiet little restaurant, Neil spoke personally about his grief surrounding the very early passing of his friend. It was very difficult for Neil. He cradled his face in his hands and mourned. He said very honestly, “I miss him so much.” It was like a punch in the chest and a knife to the brain for me. I’m an Englishman, repressed emotionally, possessed of a stiff upper lip, and uncomfortable around death. To see another, even more archetypal Englishman, publically display his grief was… liberating, as well as being deeply upsetting. With all the skill every writer longs to muster, Neil connected me to my own grief, helped me experience and evaluate my own sense of loss around a childhood hero, a venerated figure, an idol and example I’ve tried to follow. Everyone has strange catalysts for strong emotion, experiences and tools that help us to manifest and ultimately, hopefully, deal with significant feelings like grief. For me, it was seeing a distant and public figure suddenly act very like myself, in a very personal way. I’d had a hint of it when Terry first passed, back in 2015, and Neil’s wife Amanda Palmer tweeted a very brief but personal message, which I wrote about at the time. Seeing it in almost real-time, there on the screen, magnified the experience a hundredfold. It is still very upsetting. Grief always is. Grief shared is, however, a little easier to deal with. This entry was posted in Uncategorized and tagged links, media, mourning, neil gaiman, news, personal, response, terry pratchett. Bookmark the permalink. I watched the show with my partner, we both nearly in tears with the show. I liked the more human touch of honest emotions of family, friends and fans. It was like so many of the things equally sad but happiness it brings in their memories. I think it was fitting tribute to a great literary genius who was so human. Lovely to your post.